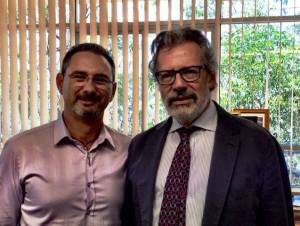 Recently it was an absolute honour and a privilege for both myself and Clarence Tan, to sit down with a global expert in suicide research, Professor Diego De Leo; the Director of the Australian Institute for Suicide Research and Prevention…, as well as The Life Promotion Clinic. We both learnt so much about the global perspectives on the studies behind why people choose to end their lives, for e.g., did you know that in many indigenous cultures, including ours, they didn’t have a concept of suicide until alcohol was introduced?! Worldwide, the suicide rate has declined by around 9% over the past ten years but in the USA the rate has increased by about 30% in the past 20 years! Do we really want to follow in their footsteps? Future meetings will be going ahead in the New Year to discuss how we can better understand, and tackle this issue once and for all. Jennifer Burke joins the team. Jen here! Thanks to the help of the not-for profit organisation known as Silicon Lakes at Varsity Lakes on the Gold Coast, I’m excited to officially be part of the Comedy Unlimited Living with Laughter team! 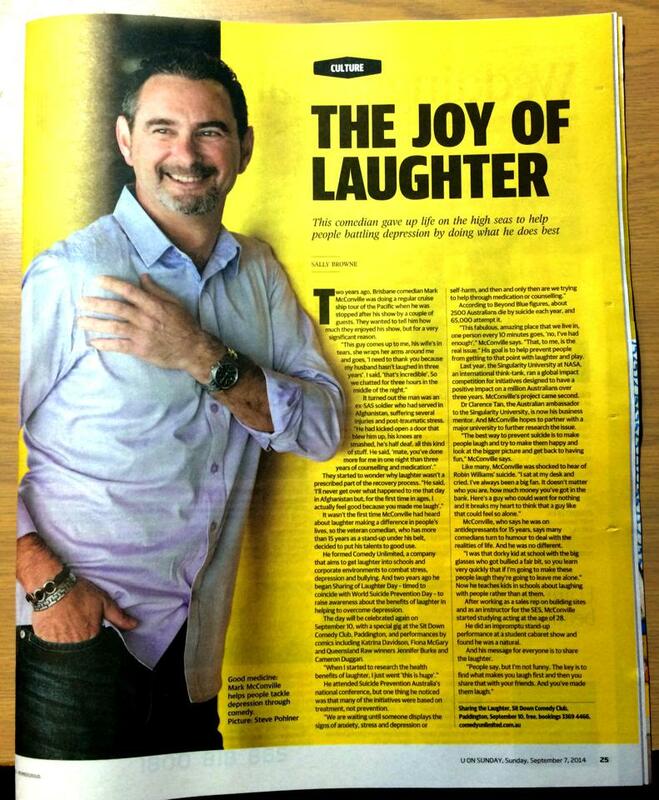 Over the next few months I’ll be helping out mostly with the social media aspect of the business, trying to get the word out about what we’re doing so that “Living with Laughter” can actually become a reality for the unfortunate number of Australians affected by mental health issues, depression, and suicide every year. Lots of research towards realising this goal will also be on the agenda, as well as all the other ins and outs that come with building a business which has the potential to play an integral role in making all of our communities, towns, and cities a better place to be. I look forward to putting my all into this and doing something which not only has the ability to put a smile on the dial of others, but will no doubt produce a grin from ear to ear on my own face for a very long time to come. 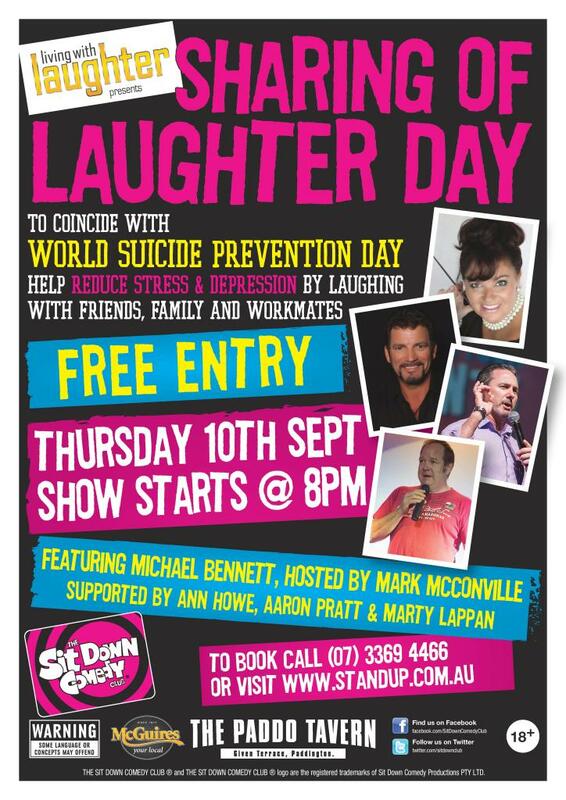 Living With Laughter’s first ever FREE EVENT for Sharing of Laughter Day on the 10th of Sept.
A huge Thank You to the following people in helping make this happen. And from The Sit Down Comedy Club, Fedele Crisci, Kate Rudge, and Beck Shandeliar and everyone who has helped in sharing this and getting the word out there. The support has been amazing, thank you all so much !! 3rd year running, let’s make this a big one my friends. 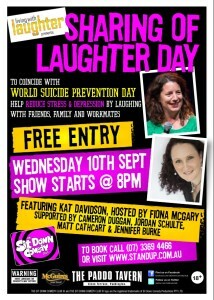 45 days to go until our 3rd annual Sharing of Laughter Day.